In this post we examine five of the best-selling rain barrel kits. First we'll examine what they are and how they're used before diving into a detailed comparison. Collecting rain water has been going on since before running water in a home was an option. Today, though, not everyone needs to collect rainwater to drink and use (Source). Collecting rain, however, can be beneficial in several situations including as a resource during droughts or for gardening irrigation. These barrels are the perfect means for trapping water. They vary in their exact sizes and shapes, but they all collect water for you (Source). This process is simple and doesn't even need any work on your part. They can even be a simple as a container or complex systems to trap as much water as possible (Source). Some interesting distinctions between the kits- the Etna barrel is collapsible. 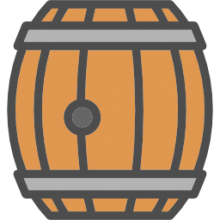 The Good Ideas barrel has the classic whiskey barrel look. The Good Ideas urn has a more modern look and the largest capacity at 65 gallons. The Enviro World rain capture system actually has 3 different spigot locations- convenient depending on how you drain your barrel. The first thing that customers noticed about these rain barrel kits was their style. These five products boast a variety of options from Good Ideas' barrel model to Suncast's cube. Another variant that these offer is color. Some models do only come in one color. Yet, options such as the Enviro World and the Good Ideas' options do offer many color choices. The Suncast model was, by far, a fan favorite. This was, in large part, thanks to its solid 50 gallon capacity. Further, buyers say that it is a particularly durable model. On the lower end of the spectrum, though, was the Good Ideas' Rain Wizard kit. Many customers complained of their product not looking as realistic as advertisements promised. Some customers also reported issues such as their brass nozzles being plastic rather than brass. This inconsistency was frustrating to customers. When it comes to purchasing rain barrels, customers had a couple points of advice for new buyers. First, they recommend that you read the reviews carefully. Not only to see what they wrote, but to make sure you are getting specifically what you want. For example, some barrels their excess drained by hand while some don't need any manual drainage. 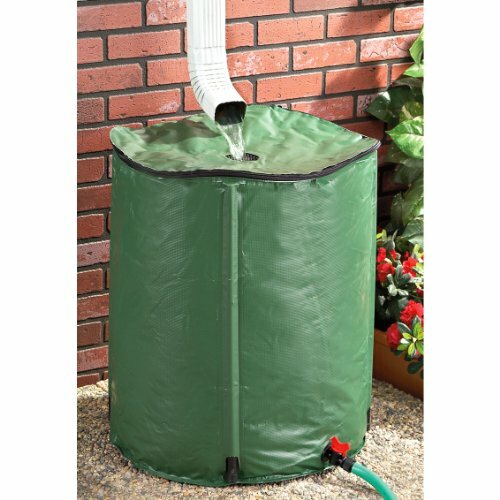 The Good Ideas 50 Gallon Rain Barrel is a solid option if you are looking to save money on water bills.Users love the sturdiness of the barrel, but some do complain about the low drainage pressure. 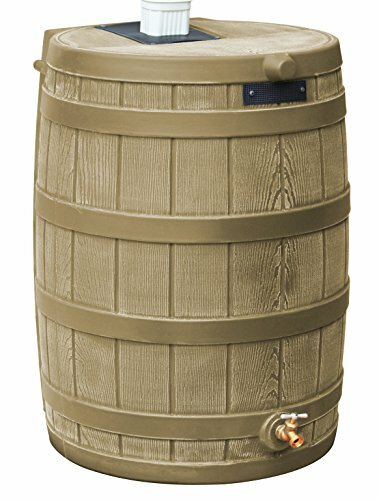 This product is a rustic faux oak rain barrel that has a flat-back space-saving design. It is made of ultra-tough, BPA-free, FDA approved polyethylene. 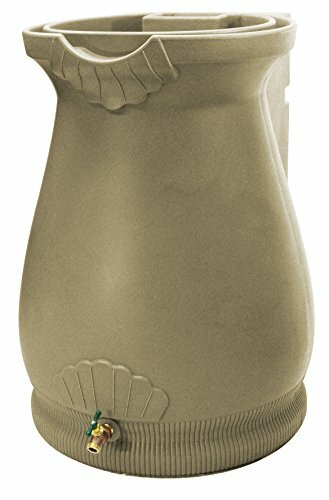 The barrel features an anti-debris screen that keeps out bugs and gutter garbage.It is available in 5 colors (oak, black, green, khaki and terra cotta). This item seems like a solid choice if you want a rain saver that has a classic whiskey barrel look. In general, users are happy with the Good Ideas Rain Barrel. They state that it is very sturdy and doesn’t bow when full. Users appreciate that the drainage hardware is durable and doesn’t leak. However, some buyers complain about the low drainage pressure, even when the unit is full. 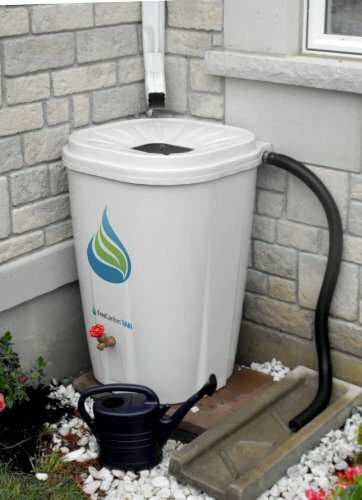 Many purchasers state that the barrel holds only 30 gallons of water. The Enviro World Corporation Rain Barrel is a solid option if you want a rain urn with a beautiful and clever design. Users like the stylishness of this barrel, but do complain about the poor quality. This rain saver has a stylish appearance of an ancient terra cotta urn. It is constructed with thick and durable polyethylene resin. The flat-back design allows you to position the barrel close to walls or flat areas. There are 8 different colors available. This item could be a solid choice if you want to give your garden the best water it can get, free of harsh chemicals and rich in nutrients. In general, users have a favorable opinion of the Enviro World 55 Gallon Rain Barrel. They agree that not only it saves water but also enhances the look of your yard. Users like that it is well-designed and very sturdy. However, many buyers complain about the poor quality and durability. Several purchasers complain of receiving a defective item. When you use water that you catch, it's free. With a rain barrel kit, you won't have to pay for this utility! This is a green way to water plant, wash cars, and even pets. After all, you won't be letting rain water go to waste this way. Moisture levels in your foundation can rot the wood. Catching rain water before it falls to the ground protects you from this. Erosion is a huge problem in some areas. By catching rainwater, you are helping to protect the environment from runoff. Rainwater is better for gardening. This is thanks to a high level of oxygen and a low level of other chemicals. Even a small rain barrel can give you enough for your plants. If you are looking for a rain collection system that won’t look worn out after one season, you might want to consider this one offered byGood Ideas. Users like the construction of this barrel, but do complain about the quality and durability. This product is high-quality injection molded and made from high-density polyethylene, which keeps it looking clean and new, year after year. Its sleek flat back square design fits naturally in any location around the home. The location of the spigot allows for easy access without the need for a base. It comes in three colors (beige, black and terracotta). This rain barrel might be a solid choice if you want to preserve precious warm natural rain water for your garden or lawn. In general, users have a favorable opinion of the Good Ideas 65 Gallon Rain Barrel and they agree that it is well-designed, well-built and of great function and value. However, some buyers complain about the quality and durability. One dissatisfied buyer shares that the base cracked after one season. Another one states that the spigot constantly drips. If you are looking for a top-rate drain barrel, you might want to consider the Suncast 50-Gallon model. Users love the usefulness of this barrel, but some do complain about its flimsiness. This durable resin barrel holds 50 gallons of water. It includes a leader hose and a shut-off valve and features a screen on the top which prevents bugs and gutter garbage from falling in. This item could be a good choice for gathering 100% pure rain water to reuse on your lawn and plants. In general, buyers are pleased with the Suncast RB50D Rain Barrel. They appreciate that it is sturdy, easy to clean from the mildewalgae, as well as that the cover fits tightly. Users agree that it is a good value for the money. However, some buyers say that it is very flimsy. Several purchasers share that the bottom split after only one year. The Etna Rain Barrel is a solid option if you are looking for a “soft water” container. Users like the value/price ratio of this barrel, but do complain about receiving a defective item. This product collects water from rooftop runoff and provides you with an ample supply of water free of chlorine, lime, or calcium with fewer sediments and dissolved salts than municipal water. It features a discharge valve at the bottom which can be used with a standard 1/2“ hose. 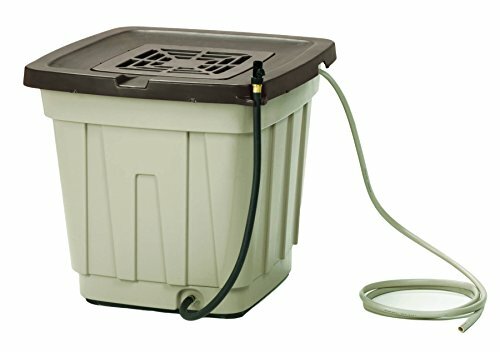 If you are looking for a collapsible rain barrel for easy storage, this might be a solid option. The general user consensus concerning the Etna Portable Rain Barrel is that it is sturdy and a great value for the price. Users also appreciate its portability. However, some buyers complain about receiving a defective item. Some complain that the barrel is very flimsy and not solid enough for holding larger amounts of water. There isn't much content on the Internet regarding what to do with a rain barrel. We took a deep dive and examined how homeowners use rain barrels and the extra water source they provide. While this is all natural water, it's important to remember is not safe to drink unless you treat it and filter it. This is especially true if your rain barrel is collecting water from a drainage spout that runs through the roof. It will carry pollutants and toxic chemicals. Just imagine, all of the water accumulated in the rain barrel will likely have been tainted with smoke stack manufacturing pollution and runoff debris filtered through bird droppings and dead insects. HowstuffWorks.com says, however, that your vegetables and flowers can thrive using this water- as long as the water flow is at ground level. Some other best practices when using the rain barrel, it's advised that the top is always kept firmly in place- you don't want to expose it to sunlight because this can cultivate algae growth. In addition, if the rain barrel has a screen protector, they should be kept secure so that mosquitoes and other insects attracted to water don't aggregate in it. Another handy tip, you should do a quality inspection of the rain barrel seasonally to make sure it hasn't sprung any leaks. If you plan on using the rainwater and it's collecting water from a roof gutter, you can increase the quality of the collected water by cleaning out your gutters, removing debris so that it's cleaner when it falls from the downspout. In cold winter climates, it's important that your rain barrel doesn't freeze- this can cause it to crack and destroy it. In this instance, you may want to discover alternate means of collecting water- ensuring that water is not pooling near and around your home's foundation. Because the topic is so important, the distinction should be made between potable and non-potable water. City governments and states are responsible for chemically treating water to kill off bacteria. This makes the water potable and safe to drink. Though in many other areas of the world where citizens access secondary water sources that are non-potable it can potentially be dangerous to their health. That's not to say that non-potable water isn't usable- many individuals will find that this type of water is used to flush toilet systems and water flower and vegetable gardens. You just need to be sure that you are not cooking with it for drinking it. If you're interested in building your own water conservation system by creating your own rain barrel, Hgtv.com provides DIY construction guidelines for doing so. The blueprints will walk you through purchasing a large plastic barrel, drilling holes in it, using pipe adapters and adding a spigot to the pipe. One important point they made is if you are going to treat your roof, whether that is by spraying insecticide or treating the wood chemically, you'll want to unhook the rain barrel for at least two weeks or so to make sure you're not gathering chemically tainted water runoff.